I’ve been in somewhat of a torpor since cracking a rib earlier in the week. Planting, digging, relocating potted plants, shoving heavy things around, in other words, my favorite pursuits — very little of this is possible at the moment. Trying to ignore the situation and just work through the pain does not seem to be the quickest road to healing. So a drive down to San Diego tomorrow for the San Diego Cactus & Succulent Society sale and show will be positively therapeutic. If the flat tire on my car is fixed in time. It’s been that kind of a week, hasn’t it? 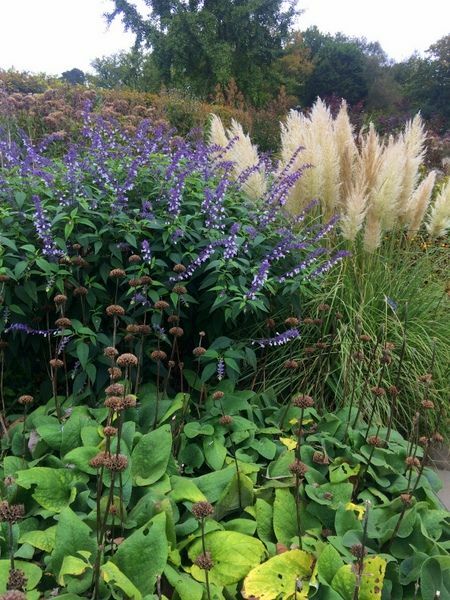 Garden Rant had a piece this week on the limited release of Five Seasons: The Gardens of Piet Oudolf. I’d already had the date of June 29 calendared, which is when the film will be shown at the Royal in Santa Monica, with a Q&A with the filmmaker Tom Piper opening night. 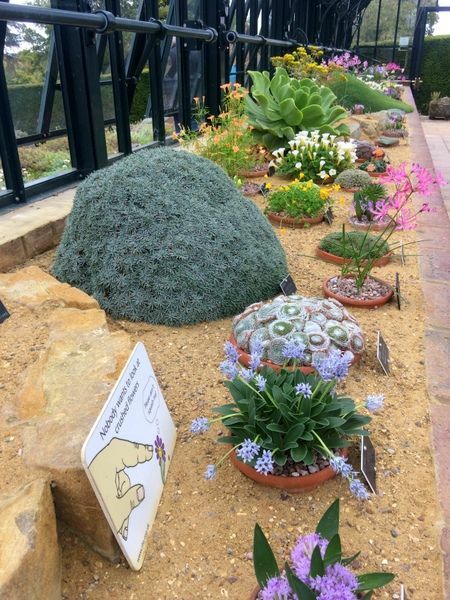 Upon reading in Garden Rant that “Oudolf and his evocative garden designs have been drawing international attention since he designed the Royal Horticultural Society’s Glasshouse Borders in Wisley, England,” I went over my photos again taken at Wisley last October. How did I miss these borders? Maybe this snippet is from one of the glasshouse borders? Judging from my photos, my attention was elsewhere. In the glasshouses, it seems. 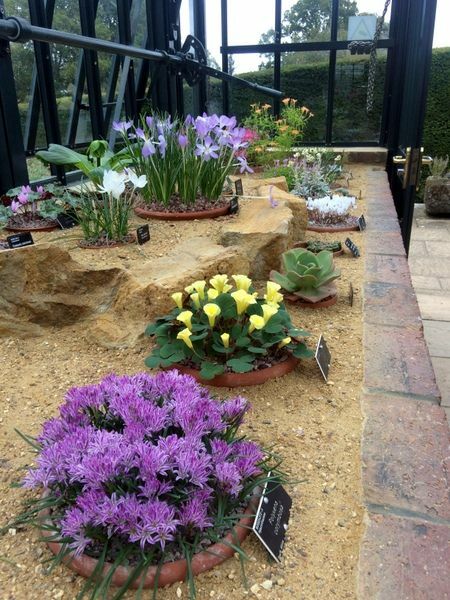 These were the smaller glasshouses near the rock garden. My own Aeonium nobile has sent up a bloom stalk the past week. Something this fabulous just has to be monocarpic, of course. 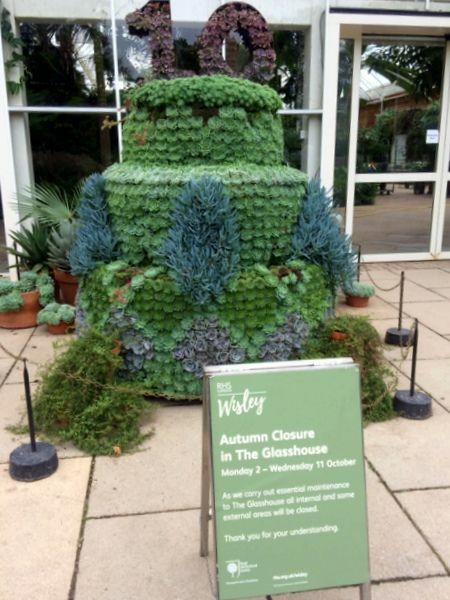 The ginormous glasshouse which the Oudolfian borders reference was shuttered for renovations but still able to muster a cake to celebrate its 10th birthday. 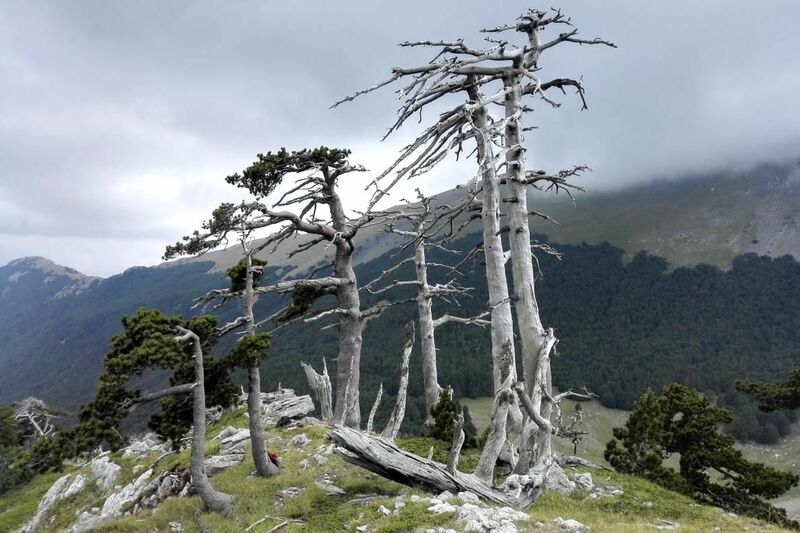 And speaking of mortality and aging of plants, I loved this quote from National Geographic’s “Oldest European Tree Found—And It’s Having a Growth Spurt“: “aging isn’t programmed into trees, so they are effectively immortal.” What a cheerful thought! And checking out the photos again from my trip to England in fall 2017, I found the inspiration for a recent plant order to Annie’s Annuals. 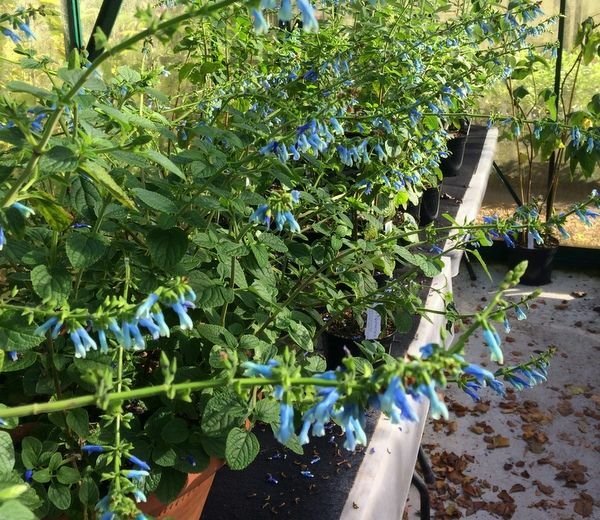 This is Salvia bullulata on the growing bench at Derry Watkins’ nursery Special Plants last October. Blue is not an unusual color in the protean genus salvia, but the limpid blue of S. bullulata is very unusual for a salvia and reminds me of the turquoise shades possible with corydalis. I pounced when Annie’s offered it this spring. Currently out of stock, you can add it to your wishlist. 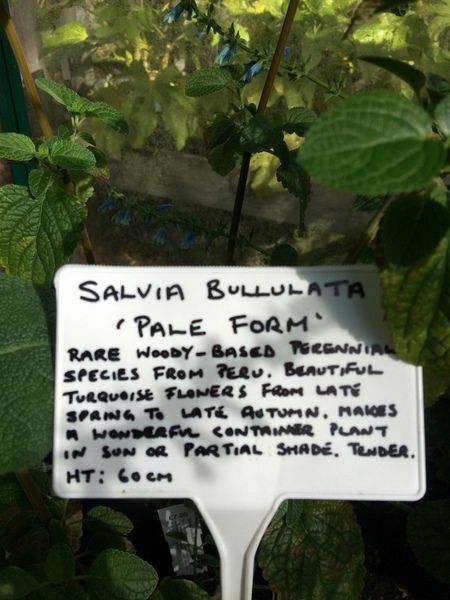 Another salvia first seen at Special Plants, ‘Jean’s Jewel,’ was tracked down state-side to Flowers By The Sea, which has an incredible list of salvias. ‘Jean’s Jewel’ is a guaranitica hybrid with atypical violet-pink flowers and somewhat more compact habit of growth. This entry was posted in Cinema Botanica, clippings, garden travel, pots and containers, succulents and tagged Annie's Annuals & Perennials, Derry Watkins Special Plants Nursery, Five Seasons: The Gardens of Piet Oudolf, Flowers By The Sea, RHS Wisley, Salvia bullulata 'Pale Form', Salvia guaranitica 'Jean's Jewel'. Bookmark the permalink. With the exception of your poor cracked rib, this is a wonderful collection of clippings. 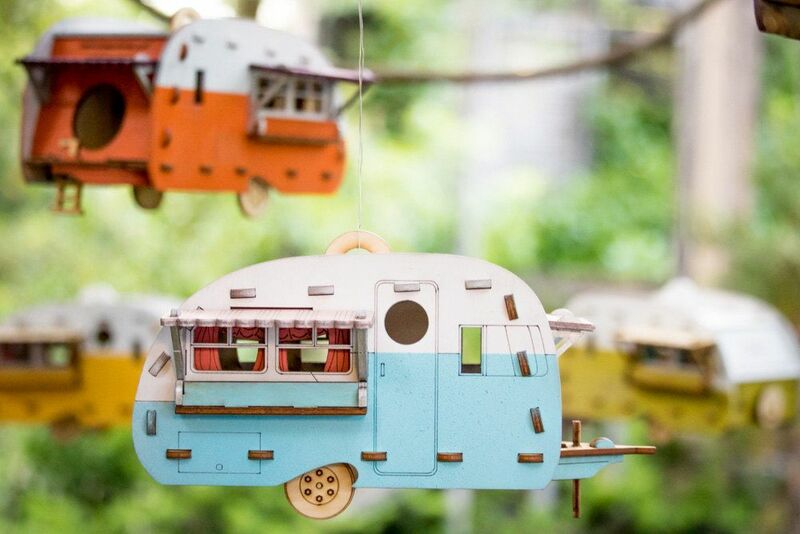 I love the birdhouses and intend to wishlist that Salvia even if I do have a bad track record with Salvias in general. One of my friends gave me an Annie’s gift card for my b-day…I hope your tip to San Diego is a smooth one. A cracked rib? How the heck did you manage that? Ouch. 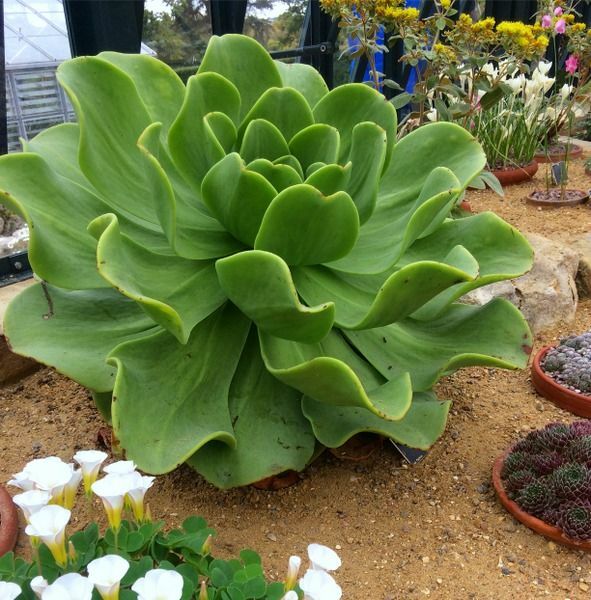 A trip to San Diego (and a Cactus show/sale) sounds like just what the doctor ordered. I do hope you’re not driving yourself though. Please take care. All of this (minus the cracked ribs and flat tire!) looks wonderful. That blue salvia reminds me of some of the colors in Austin… Best of luck at the sale, and I hope your weekend ends your week on a high note! Cracked rib? Sounds like you mountain bike the dangerous trails I avoid…I’m glad you can still walk and drive. Another enjoyable, variety-filled post right down to the oldest tree in Italy. Just arrived here from enjoying HoovB’s photo of you having a delighted laugh in the B. Jane garden. You may want to wait until you’re healed a bit to look at it (because “it only hurts when…” ). Have a wonderful time at the c&s show! Best wishes for quick and complete healing. Cracked rib? Hope it heals fast. My nobile is flowering also. I hope your C&S show visit is a fun one. Ouch! Mike did that so I know how painful it is. Please take care! Derry Watkins’ nursery is a wonderful place. I little more than a day trip for me sadly. But perhaps from a budgetary perspective it is just as well. @Kris, the traffic on Saturday to SD was like rush hour! The way back to LA was smooth sailing tho. @Loree, I wish there was an adventure to tell, but I leaned hard over a high-armed chair! Strangely enough, the same thing happened in the same chair with Duncan a few years ago — so it’s not old age, just a rib-cracking chair! @David, see note to Loree — very sedentary, boring injury! @Nell, what a crazy, cackling photo! Hope I didn’t scare any flingers! Good luck with that pelarg. Yes, it would be great to swap weather and locale every once in a while! @Hoov, I hope you post a photo of your nobile. My bloom spike is very odd looking, not what I remember at all for this aeonium. @RD, yes, your budget must take a prodigious hit with all those great nurseries. Her nursery is up a very long track too, but I’m so glad to have made the visit. She was lecturing in the U.S. at the time. I’d love to go back and see the garden.